Hurricanes Harvey was one of the most devastating natural disasters to impact the United States in recent years. Although the storm was anticipated to cause rampant destruction in New Orleans, the city survived largely unscathed from severe damage. Generally, each new storm creates a maelstrom of emotion, high amounts of displacement, and property damage that harken back to the devastation caused by Hurricane Katrina in 2005. Although not as devastating as Hurricane Katrina, National Weather Service forecasters predicted that nearly 10 inches of rainfall would flooding in Western Louisiana. Luckily, New Orleans only got 5.88 inches. Although it doesn’t sound considerably devastating, just one inch of flood water can cause up to $20,000 in damage for an average-sized home. Flooring, furniture, drywall, and other appliances are susceptible to flood waters. However, the storm lost most of its power by the time it crossed the Texas-Louisiana border. After Hurricane Katrina, a team was installed to help provide sustainable protection from severe flooding and storms. A new professional is now leading the Louisiana Recovery Authority after Hurricane Katrina and Rita to manage drainage infrastructure for weather emergencies. Louisiana Governor, John Bel Edwards, briefed the media that some of the previous levee problems were due to aging infrastructure problems. Later, he met with residents while they prepared for the storm. In the weeks before Hurricane Harvey hit, a series of storms hit the Big Easy. But the city cleaned 900 street-level catch basins since flooding on August 5th. In response, the city planned to fast-track routine maintenance of 68,000 catch basins. NOLA’s mayor, Mitch Landrieu, said the city had been preparing for a couple weeks to take precautions against the storm. Throughout the city, several fire and police stations prepared almost 20 high-water vehicles and 40 boats with rescue supplies. Mandatory evacuations were not set in place because the storm was not set to directly hit New Orleans. However, residents were directed to prepare for a “shelter in place” if floods increased. Since Hurricane Katrina’s devastating impact, New Orleans citizens understand the devastating impact of each hurricane season. As a result, many seek to help neighboring towns and states that need assistance during times of need. As rains fall on New Orleans during Hurricane Harvey, some residents pitched in to plan for provisions, shelters, and medical supplies at local rescue stations. After the worst of the storm hit, Louisiana’s Governor John Bel Edwards said the state sent two top emergency response officials and search and rescue equipment to Texas to help. 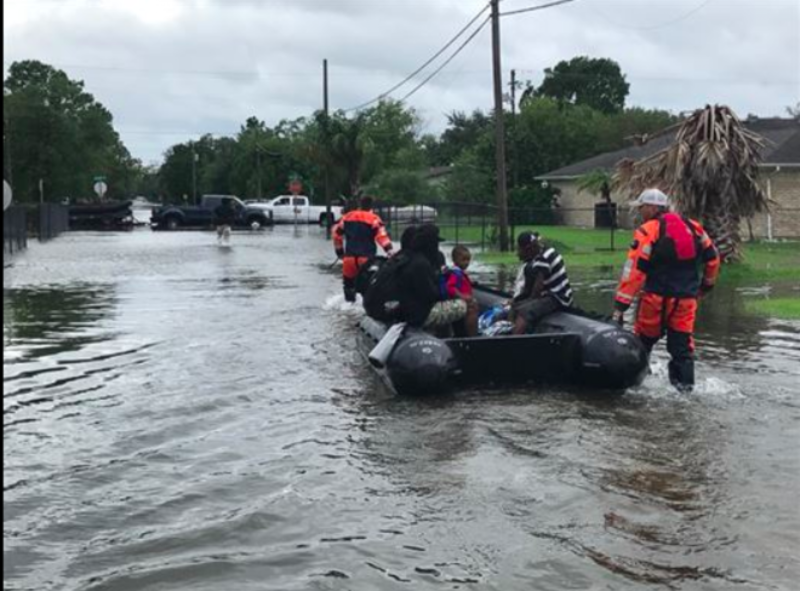 With several death in Houston, community members in New Orleans decided to offer a helping hand to displaced Texas citizens. Many New Orleans restaurants have set up a program to accept and distribute gift cards to hospitality workers affected by Hurricane Harvey. New Orleans residents can find out how to help here. The Second Harvest Food Bank is also taking donations to help people in need. Three locations including the main warehouse and facility (700 Edwards Avenue), The Lafayette warehouse (215 E. Pinhook Road), and The Northshore Food Bank (840 North Columbia Street) are all setting up areas where NOLA residents can donate food. Additionally, restaurants Mondo and Rosedale have become designated drop-off spots for the Second Harvest Food Bank. Plus, if you donate with a receipt, you can bring it to the restaurant for a free Texas special with drinks that include brands like Tito’s Vodka, Shiner Bock, or Saint Arnold. In early September, locals also attend a Cure NOLA and Pableux Johnson fundraiser. Red beans, cornbread, and cocktails will benefit the Red Cross of Houston. On September 15th, the We Stand as One Hurricane Harvey Concert and Fundraiser also helped locals come out and donate to this crucial cause. It’s great to see New Orleans citizens come out to help others in need, especially when others are going through life-changing devastation very similar to Hurricane Katrina. Why not take time to donate, attend a fundraiser, or create your own donation center? With so many people pitching in to help others, the impact of Hurricane Harvey in a post-Katrina world shows how compassionate just how compassionate the community can be to those who need it most.